Exploring the colonial tracks of Paraty - hunting.places. 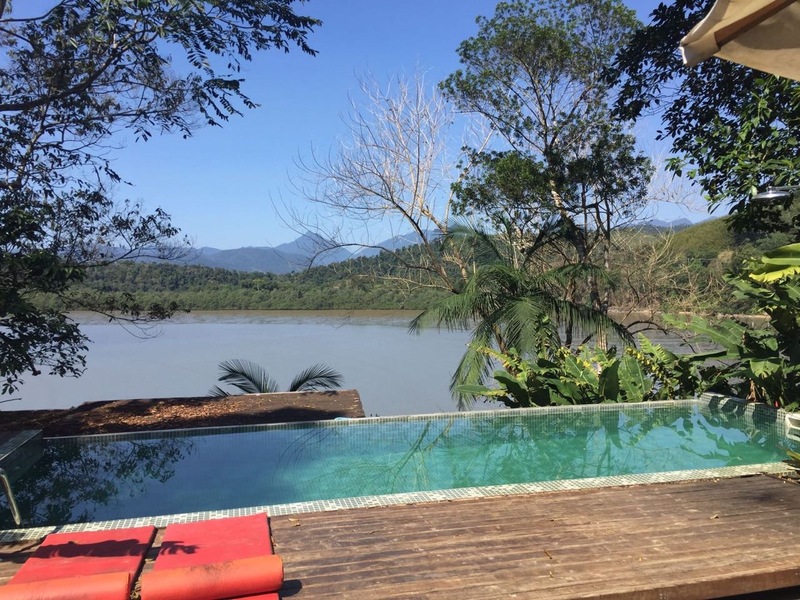 Located in between jungled mountains and surrounded by several bays with incredibly secluded beaches, Paraty in Brazil not only offers a great natural setting but also appealing culture. We will show you the four main reasons to hunt for this place. Paraty as a rather small city itself can be separated into two individual parts. On the one hand, you can visit the newer part of this town with all of its tourist offices and on the other hand you have its Paraty`s colonial centre for which it is known. The ancient city centre surprises its visitors with exquisitely preserved buildings and non-automobile traffic. This means that no cars are allowed in the colonial part of the town, granting the streets a centuries-old spirit. Drinking a cocktail in the ancient town centre of Paraty. When strolling through the sort of cobblestone routes, you pass by small, authentic restaurants and several bars with live music during most nights. Really a great and refreshing experience showing that sometimes the world is better off without cars. Even the Brazilian government acknowledged this peculiarity by declaring Paraty as a National Historic Site since 1996. The city´s history dates back to the 16h century when Portuguese settlers arrived in the Paraty region, which during this time was inhabited by the indigenous Guaianás people. Almost a century later the beginning of the prosperous future story of this town was written. With the discovery of a nearby gold mine in the state of Minas Gerais, Paraty was chosen as the main stopping point on the route from the mines towards Rio de Janeiro . This gold rush led the town to a busy and important hub with nice churches and elegant, white buildings. When suddenly a new road, connecting the mines and Rio but bypassing Paraty, was build in the 18th century, the city started to decline. Today, the area cozens many domestic as well as international tourists with ancient history and a spectacular landscape with remote bays and hills shrouded by jungle trees. As mentioned before, Paraty can offer many good restaurants and bars. At night, many performers play live music, mostly traditional Brazilian rhythms. As the town is an important touristic port, obviously the prices of entertainment and food then exceed the local average. However, we managed to find cheap and comfortable places that offered full meals for less than 5 Euros. The standard drink in Brazil, a Caipirinha, is served in almost every venue. The prices tend to range in between 10 to 20 Brazilian reals. Even in the colonial centre of the town, only a short observation is necessary in order to encounter the perfect Brazilian restaurant with classic Frango Churrasco. Doing the schooner tour during a beautiful day. The dreamy location of Paraty, being right next to the sea with hills in the background, marks the perfect setting for day trips. We personally enjoyed a five hours schooner tour, stopping at secluded and beautiful beaches and serving Caipirinhas throughout the day! Definitely recommended! Furthermore, did we pursue a trip to the huge natural waterslide, just a short bus ride away from the bus station in Paraty. The area there also offers several great hiking tracks to viewing points and waterfalls. If you do not have that much time, a half-day trip to Trindade (south of Paraty) can just be what you need! With a beautiful beach, a sleepy town centre (with great restaurants tough) and waterfront bars, Trindade also is a great stop on your trip. Just a short drive from Paraty an amazing waterslide awaits adventurous travellers. Monkeys being everywhere at our house. Just a short drive from Paraty an amazing waterslide awaits adventurous travelers. Casually a monkey invaded our balcony. Doing the schooner tour departing from Paraty.